Rob Ford told the Toronto Sun that he is feeling “pretty sick” in hospital as he undergoes testing for tumors in his abdomen and lungs. Toronto Mayor Rob Ford, who withdrew from his re-election campaign last week, told the Toronto Sun doctors went “into my lungs” to take “another biopsy”. Rob Ford has been diagnosed with an abdominal tumor. His brother, Councilor Doug Ford, has replaced him on the October 27 ballot. Doug Ford has not yet held an official campaign event, saying he wants to spend time with family while his brother is in hospital. 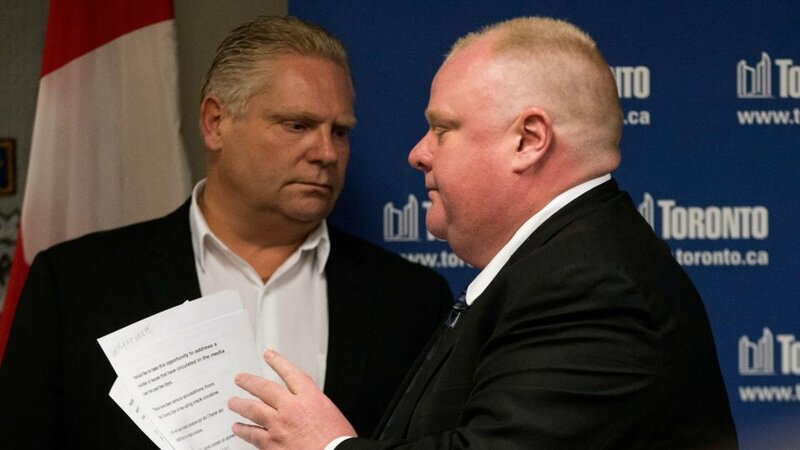 At the same time as he withdrew from the mayoral election, Rob Ford’s name was added to the ballot papers to run for councilor in his old constituency of Ward 2 in Toronto’s Etobicoke North area, signaling his desire to remain a political force in the city. Rob Ford’s sudden announcement of his illness and subsequent withdrawal from the race presented a remarkable turn in a tumultuous tenure in the city hall of Canada’s largest city. Over the past year, Rob Ford admitted to smoking crack cocaine while in office, then did a month-long stint in rehab. He resisted pressure to resign even as the city council stripped him of most of his budget and authority. Rob Ford continued to run for re-election until last week, when he was brought to hospital after complaining of pain in his abdomen. He has been in hospital since and is reportedly waiting on results from a biopsy test. “I’m feeling pretty sick,” Rob Ford told the Toronto Sun’s Joe Warmington, who reported the mayor sounded “horrible” and was “coughing and hacking and talking with a heavy breath”. The mayor said he was trying to get some work done, ringing constituents. “It’s pretty tricky right now,” Rob Ford said regarding his health, saying he hoped to recover and go back to “helping people” as councilor. It remains to be seen whether Doug Ford can pick up his brother’s support. Other top contenders in the race are former NDP MP Olivia Chow and businessman and former leader of the Ontario Progressive Conservative Party John Tory.